Many visitors and Sun Valley residents try to capture the unique lifestyle and events that make this region of Idaho a highly sought-after locale. Summer in Sun Valley is a season of celebration, which brings many people outside to enjoy the mountains, weather and the many events, which make summer in Sun Valley a special time of year. For the past year, the Sun Valley Center for the Arts Junior Patrons Circle has been working on a cookbook that encompasses the food, wine, style and glamour that is the Sun Valley Center Wine Auction. "Entertaining Sun Valley Style: Behind the Scenes From the Sun Valley Center Wine Auction" is the product of many people who helped produce an elegant cookbook for anyone to create the feel and tastes of the wine auction. In addition, the book arrives just in time for The Center's 30th annual wine auction, July 21-23, for those wanting to try out the book's mouth-watering recipes to honor The Center's anniversary. "It's a combination of vintner dinners, hosts, chefs and those who wanted to participate," said Sally Boettger, The Center's co-executive director. "We went to the restaurants who all play an active role in the wine auction dinners and picnic." Boettger said people who have worked with The Center for years had great enthusiasm and support for the cookbook. "The chefs really like local products, especially lamb because lamb is a treat for them to work with," she said. "Lamb is also great for tasting bold red wines." The cookbook includes 18 chefs, 72 recipes, 87 wine pairing suggestions and 21 style and entertaining tips. Seven wine auction vintner dinners are featured along with a resource guide for wine, restaurants, food and many other items to create a wine auction dinner at home. < The book presents several delicious ideas for a wine-tasting party, from style tips and food selections to full main courses as well as salads, sides, desserts and plenty of wine suggestions. However, the book's most attractive and appealing section is the vintner dinner menus. The vintner dinners, attended by a small number of auction-goers, at a price of $600 for this year's event, are over-the-top food-and-wine presentations. Along with the entire weekend of wine auction events, the dinners help keep The Center's programming and activities available to the community. "It's as authentic as possible," she said. "We wanted to make it accessible too." The book provides an appeal for casual elegance, which is the ambiance of the wine auction. It presents a tone about the Sun Valley Center for the Arts and the idea of honoring a new generation of Center patrons. "Many organizations in the valley have a patron base which needs to be renewed with the next generation," she said. "It is a need for The Center too." Food photography by valley residents Paulette Phlipot and Dev Khalsa and food styling by Judith McQueen capture the essence of the recipes and menus along with wine auction events. Making possible the process of creating such an elegant book was underwriting by Katherine and Buffalo Rixon, Gail and Jack Thorton and Laura and Hunter Vogel. 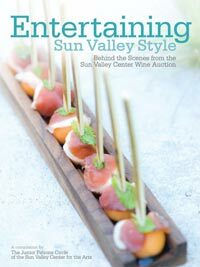 "Entertaining Sun Valley Style: Behind the Scenes From the Sun Valley Center Wine Auction" retails for $49.95 and will be available at local valley retailers. The book is also available online at www.sunvalleycenter.org, at The Center in Ketchum or by calling 726-9491. - Iconoclast Bookstore in Ketchum will host a book release party from 5-7 p.m.
- The Galleria in Ketchum at 5 p.m. will include open bar for one hour, sample recipes from book and raffle.